Professional Financial Strategies, Inc., founded in 1993 by Paul Byron Hill, CFP®, offers individuals and families (including their business entities, ERISA plans, testamentary trusts, estates and charitable entities) consultative wealth management services. 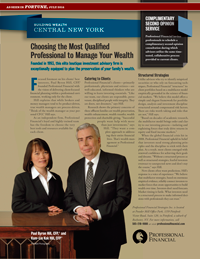 Wealth management integrates investment management, advanced financial planning and relationship management services. Advisory clients are primarily affluent or higher net-worth individuals (generally professionals, physicians, and retirees), their immediate families and close relatives, and business entities directly or indirectly owned by such individuals. Professional Financial does not sell traditional forms of financial product or services. We are compensated only by a fee. “Wealth management” is a process that coordinates two services: personal financial planning consulting and limited investment advisory services. We help our clients make informed decisions about wealth for planning their major concerns of affluent families: investing consulting, wealth enhancement, wealth transfer, wealth protection and charitable giving. Paul Byron Hill explains offers his views about client “coach-ability,” integrity and the importance of academic rigor to make well-informed decisions at all times goals. 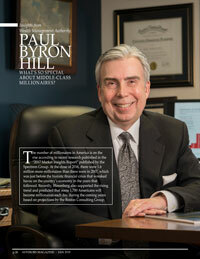 In a recent interview with “Advisor’s Magazine,” Paul Byron Hill shares his observations on middle-class millionaire personalities, describing their work ethic, and behavioral tendencies, and why he finds working with them so rewarding. 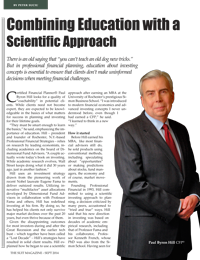 Fortune Magazine, July 2014 - Paul and Katherine Hill explain the importance of advisor independence and why clients need discipline and a structured process to make informed decisions in all market climates.